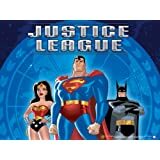 Justice League premiered on Cartoon Network on November 17, 2001. The series incorporates an all-star roster of popular DC Comics superheroes, including Superman, Batman, Wonder Woman, Green Lantern, The Flash, Hawkgirl and Martian Manhunter. It follows the premise and storyline of the DC Comics comic books, with members of the Justice League being called upon to battle against allied villains, supernatural creatures and other powerful forces of evil determined to usurp authority over the world and to destroy the Justice League. Justice League marks the first time in more than 15 years that these characters have come together in a television series since first uniting in Super Friends, which ran from 1973-85 on ABC and later on Cartoon Network. Each episode is 30 minutes long, although all of the stories will be two- or three-parters.